Friedrich Warnecke (1856-1931) was professor of double bass at Hamburg Conservatory, member of the Hamburg Philharmonic Orchestra and a pioneer of double-bass-research. 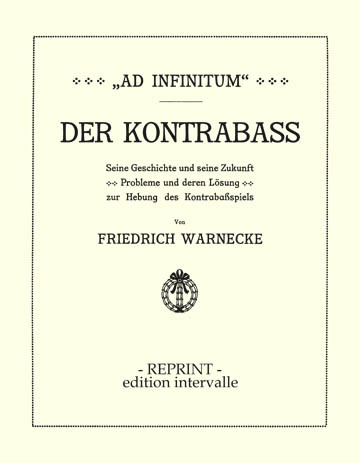 His work "Ad Infinitum" has been the first monograph ever written on the double bass. The book was self-published in 1909 in a small number of copies. For decades it was out of print, and now it is available again. Without any doubt this book on history of the double bass today is an part of history itself. With meticulousness Warnecke gathered material and created a collection of data, that are hard to get hold of today. Very interesting are his expert opinions about prominent contemporaries like Serge Koussevitzky, Lebrecht Goedecke, Gustav Láska und Eduard Madenski. His work conveys an impression of the standing of the double bass at the turn of the century. The book is a must for any double bassist, pedagogue, student, researcher and anyone who's interested in history of the double bass and the biographies of its performers. The reprint is enlarged by an index of names. This part deals with forms and tunings of early double bass instruments, the use of the double bass in music, different double bassists, methods and conservatories.